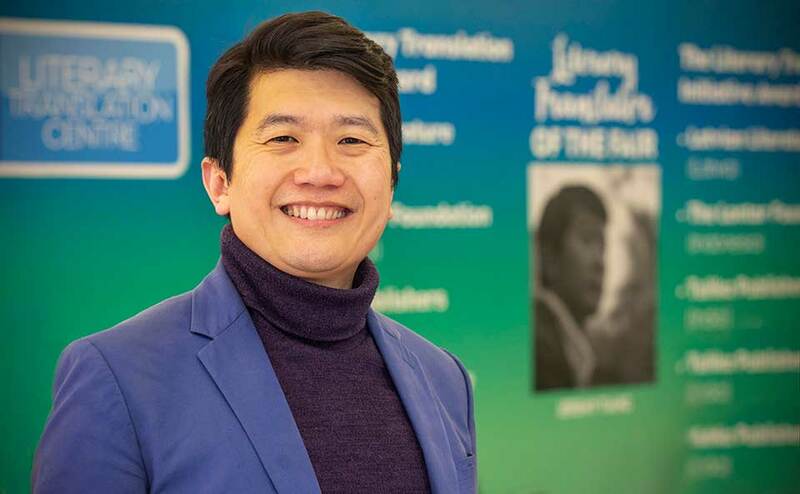 A prolific translator, playwright, novelist, and essayist from Singapore, Jeremy Tiang is the recipient of a PEN/Heim Grant, an NEA Literary Translation Fellowship, and a People’s Literature Prize Mao-Tai Cup for Translation. His debut novel, State of Emergency (2017), won the Singapore Literature Prize for English fiction in 2018. Here he discusses his role as Literary Translator of the London Book Fair, the unique experience of live theater, and expanding the range of what gets published. Michelle Johnson: You are the first ever Literary Translator of the London Book Fair. Why do you suppose this new role was added this year, and what are your duties? Jeremy Tiang: Giving something a face makes it easier to relate to. Rather than the abstract notion of supporting translation or translators, placing an actual translator in a position of prominence serves to focus attention on the entire community, thus raising awareness of the profession as a whole. Having a literary translator’s name and image looming at people from the side of the building—walking past my giant portrait every day has definitely made this one of the most surreal fairs ever, for me—is a clear signal that literary translation is to be taken seriously and is an unignorable part of the literary landscape. I didn’t actually have that many duties—just a couple of panels, but otherwise all I had to do was exist and be visible. Like being a minor member of the royal family, this role is mostly symbolic—the ritual of the tribe elevating a single member to serve as its avatar for the duration. Johnson: If there is one message you hope to communicate through your role, what is it? Tiang: Literary translators are artists in our own right. Treat us as partners in a creative process, not functionaries. We have a lot to offer. Johnson: What are the most pressing concerns for literary translators right now? Many of us are also aware that in an increasingly divided world, we have a role in bringing voices and narratives across borders, and that what we choose to translate is increasingly a political choice. Tiang: I don’t think I want to generalize too much about literary translators—we are not a homogeneous group, and I don’t presume to speak for the entire community. That said, there has been a lot of activism amongst literary translators to secure better pay and recognition for the profession, through organizations such as PEN and the Translators Association (UK) and Authors Guild (USA), as well as campaigns such as the #namethetranslator hashtag to push for better crediting practices. Many of us are also aware that in an increasingly divided world, we have a role in bringing voices and narratives across borders and that what we choose to translate is increasingly a political choice. Johnson: You trained as an actor and have written and translated plays. I’m interested in your take on the unique importance of live theater in this moment. This quote from an essay Jordan Tannahill wrote for World Literature Today gets to this: “Australian playwright Allison Croggan proposes that theatre, with its emphasis on the here and now, is a profoundly local and humanizing force in our increasingly depersonalized global economy: ‘In an era of globalization the intensely local and unique context of a theatre performance should be something treasured.’” And beyond being treasured, do you think live theater can perhaps have a broader impact on culture? The immediacy of live theater demands that we surrender our attention in the moment and experience it together with the rest of the audience—a rare moment of communion in an increasingly atomized world. Tiang: Yes! The immediacy of live theater demands that we surrender our attention in the moment and experience it together with the rest of the audience—a rare moment of communion in an increasingly atomized world. Translated theatre in particular marks a form of exchange that’s hard to replicate in other media—artists from one culture bringing their interpretation to a text from another culture, creating a work of true hybridity. All forms of storytelling are valuable, but the here-and-now of live theater gives it a force and vitality that can be deeply affecting, and its ephemerality makes each performance a unique experience. Johnson: I noticed that one focus of the LBF is inclusivity in publishing. Being busy with your role, you may not have much time to participate in all the other aspects of the fair, but perhaps you have thoughts about where the publishing industry is at in terms of inclusivity and how it can do better? Rather than the gatekeepers deciding to slightly broaden the range of people they let through, let’s think about openness—more ways for people to enter the profession, fewer barriers, and a willingness to broaden readers’ tastes rather than serving up more of what we’ve already had so much of. Tiang: I’m not sure I like the word “inclusivity”—of course it’s better than “exclusivity,” but if some areas of publishing are a cozy club of people-who-know-people, the solution isn’t to “include” more people in this club, but to smash down the walls altogether. Rather than the gatekeepers deciding to slightly broaden the range of people they let through, let’s think about openness—more ways for people to enter the profession, fewer barriers, and a willingness to broaden readers’ tastes rather than serving up more of what we’ve already had so much of. Needless to say, literary translation is a fantastic way of expanding the range of what we publish. A lot of attention gets placed on which voices within the English-speaking world are given a platform, and while that is vital, let’s not forget that there are many other voices farther afield, voices we may not even be able to comprehend until translators render them accessible to us.